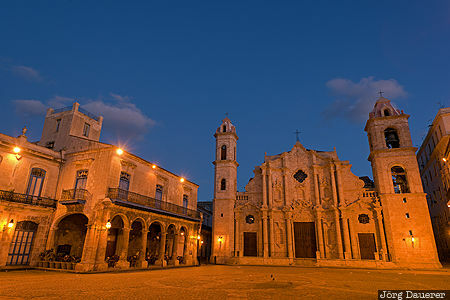 The flood-lit Cathedral of the Virgin Mary of the Immaculate Conception at Plaza de la Catedral in Habana Vieja (Old Havana) at the blue hour before sunrise. Havana (or La Habana) is the capital of Cuba. This photo was taken in the morning of a sunny day in February of 2016. This photo was taken with a digital camera.